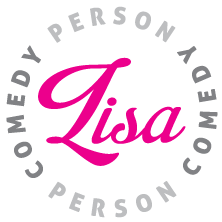 Fifty-something Lisa has been sharing her twisted, quirky takes on sexuality, dating and aging at comedy clubs and other venues for the last 5 years. Specializing in well-crafted joke writing, she’s equally comfortable performing squeaky-clean or R-rated sets. I Am Woman! Hear Me Laff! Lisa has opened for Debra DiGiovanni, Tanyalee Davis, Chris Kattan and Derek Seguin, and is a regular participant in Roast Battle Vancouver Edition.